Betty Jordan was born in Clearmont, Missouri, May 30,1926, and passed away November 17, 2011 at Pathways Hospice, McKee Medical Center in Loveland. At age 16, Betty moved with her family to Loveland, Colorado, where she met her future husband, Loyd Jordan. They were married May 28, 1944, after only three months of dating. They committed their lives to each other, to God and to their family, and were steadfast in these commitments, celebrating 61 years of marriage before Loyd passed in March 2006. 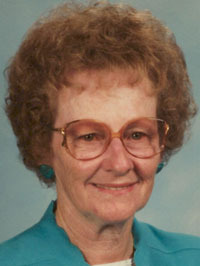 Betty lived and worked with Loyd in farming, and raised their family on a dairy farm near Berthoud. In 1972, they moved back to Loveland where they began a new career in construction. Betty lived her life with grace and honor. While she did not seek public accolades, she was an inspiration to her family and friends who witnessed her lifelong expressions of faith, humor and responsibility. Betty always had a smile and a helping hand for those in her community. She was known for her witty comments and positive outlook in all situations. Betty was a sponsor of Rainbow Girls and past Worthy Matron of Eastern Star of Berthoud. She was a member of Life Spring Covenant church of Loveland. She loved gardening, crafting, traveling, eating out, and spending time with family, friends and neighbors whose support and love was greatly appreciated, especially in her later years. Betty is survived by her children, Linda Jordan of Loveland; Dan Jordan (Susan) of Mead; and Ed Jordan (Julie) of Briggsdale; her seven grandchildren, Trent Roth (Kris Carpenter), Mick Roth (Charlene); Will Jordan (Anissa); Megan Jordan (Greg Chrimes); Ross Jordan (Vicki); Andrew Jordan; and Claire Jordan; eight great-grandchildren, Caleb, Stanley, Tanner, Evan, Danny, Alex, Shelby, and Lillian; sisters Barbara Weber of Greeley, Juanita Geist of Loveland, Esther Creeden of Texas and numerous nieces and nephews. Betty is preceded in death by her husband, parents, two brothers and one sister. Funeral services will be held on Monday, November 21, 2011, 2:00 p.m. at Viegut Funeral Home. Viewing 1 hour prior to services. A private family burial will take place at Loveland Burial Park.